Panasonic Corporation will release face recognition server software using deep learning technology beginning in July 2018. According to the company, its high-precision face recognition software can identify faces that are difficult to recognize with conventional technologies, including faces at an angle of up to 45 degrees to the left or right or 30 degrees up or down, and those partially hidden by sunglasses. In addition, the new software features the "iA (intelligent Auto) mode" that automatically adjusts settings for the camera to shoot optimal images best suited for face recognition. When it is used with Panasonic's i-PRO EXTREME series network cameras installed with the "Best Shot License Key" that comes bundled with the software, only the "Best Shots" will be sent to the server for face recognition. 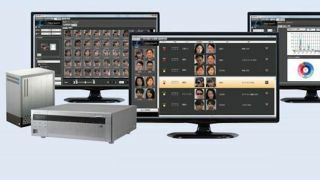 The combination of Panasonic core devices and the face recognition software maximizes the performance of the software's core engine to achieve high-precision recognition. The company plans to add a function to recognize partially covered faces with a surgical mask, which is difficult with conventional systems, by the end of this year. Using this software with cameras equipped with the iA function enables image analysis to be performed on the camera instead of the server to send only the best images to the server. This will result in reducing server and network loads, which leads to overall system cost reductions. In the case of 10 or more network cameras connected to a system, the costs can be reduced by about 40 to 50 percent compared to conventional systems that do not use the Best Shot function.